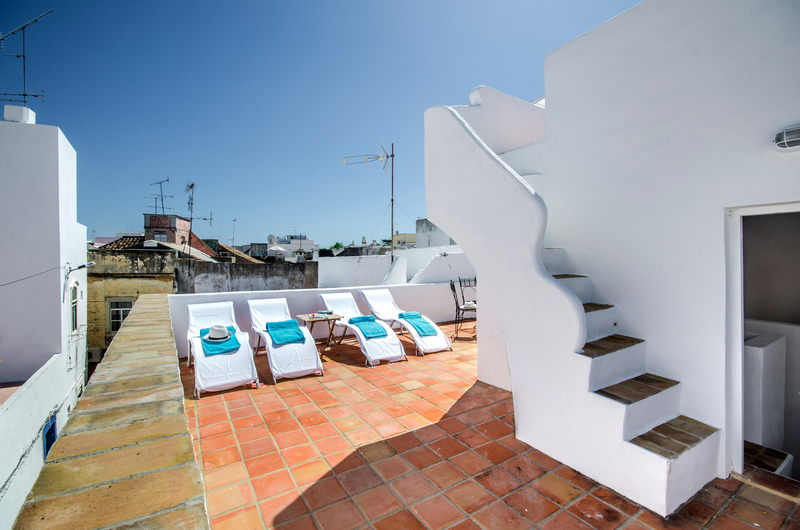 A fabulous little retreat, a 2 bedroom fisherman's cottage right in the centre of old town Olhao. 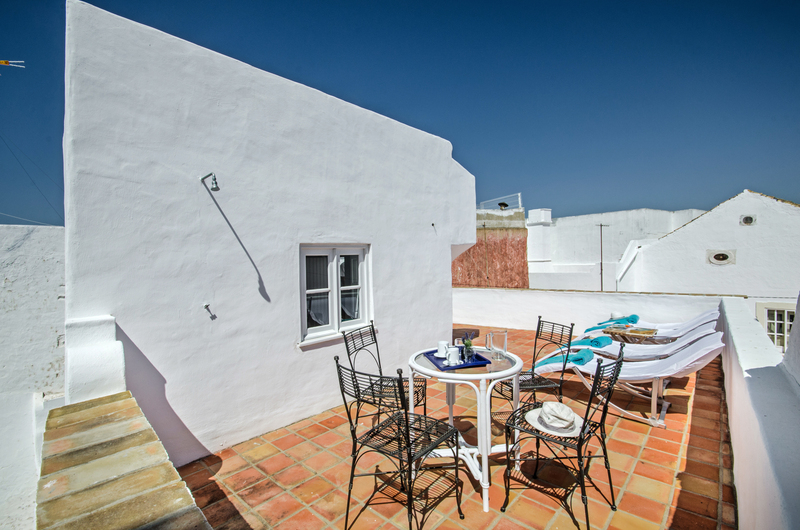 Casa Gaibeu is a delightful whitewashed cottage with glorious roof terraces and excellent wifi. 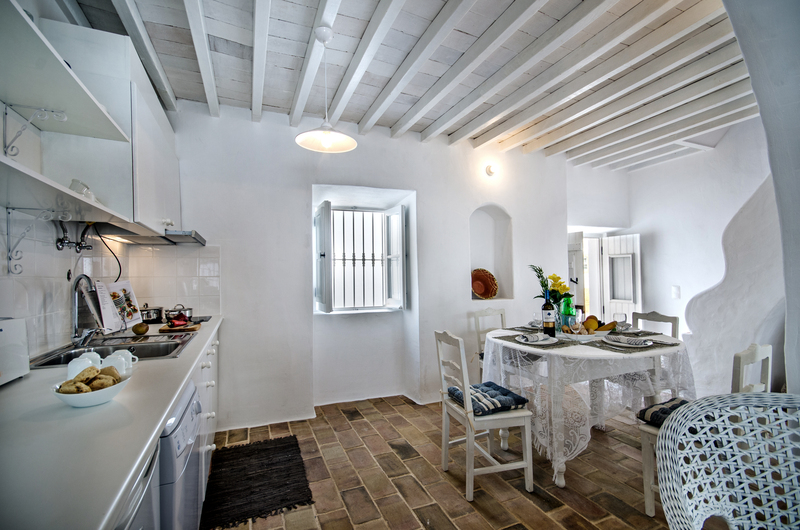 This beautiful old renovated fisherman's cottage offers a wonderful slice of old Olhao with the modern comforts. Renovated in 2014 this little piece of heaven makes for a superb 2 bedroom holiday home. 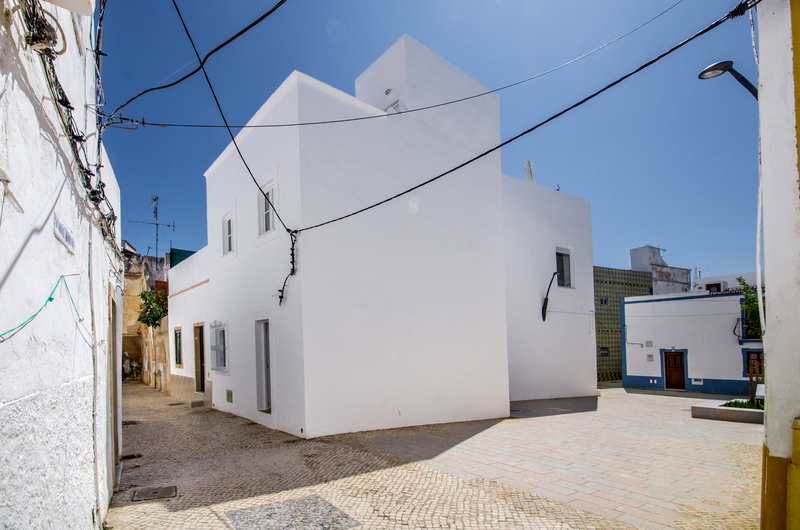 Enter this gorgeous white washed 2 bedroom holiday home from the pedestrian cobbled street via the old traditional white painted wooden front double doors into the comfortable the open plan living area. 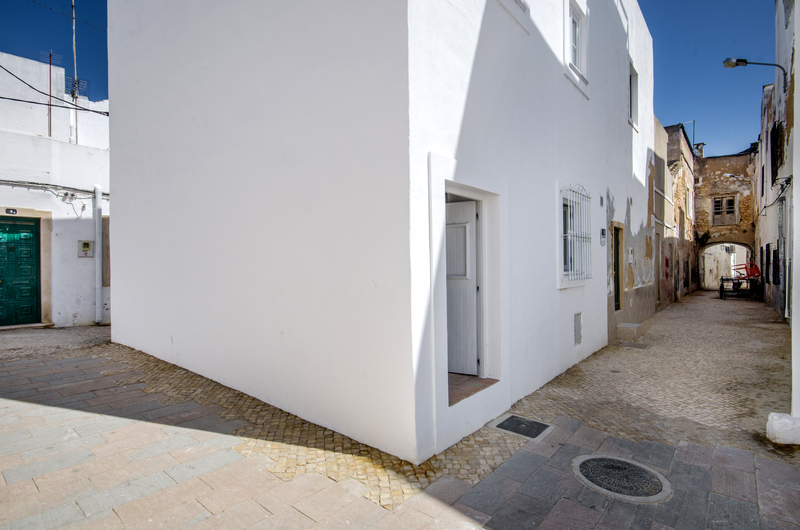 The ground floor livings space also has another set of doors at the rear of the 2 bedroom holiday home thats can also be sued and give access from the famous Largo do Gaibeu. 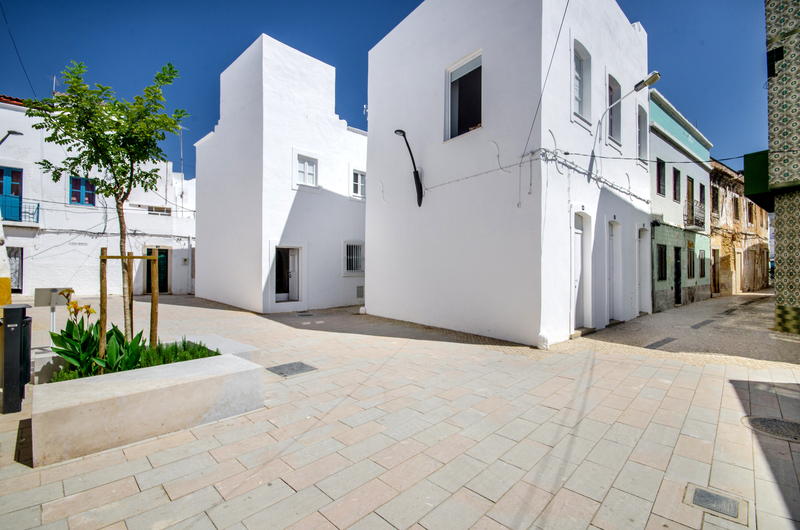 A beautiful renovated square steeped in Olhao history and legend. Both sets of doors have the traditional shuttered windows once opened allow and abundance of natural light into the ground floor. 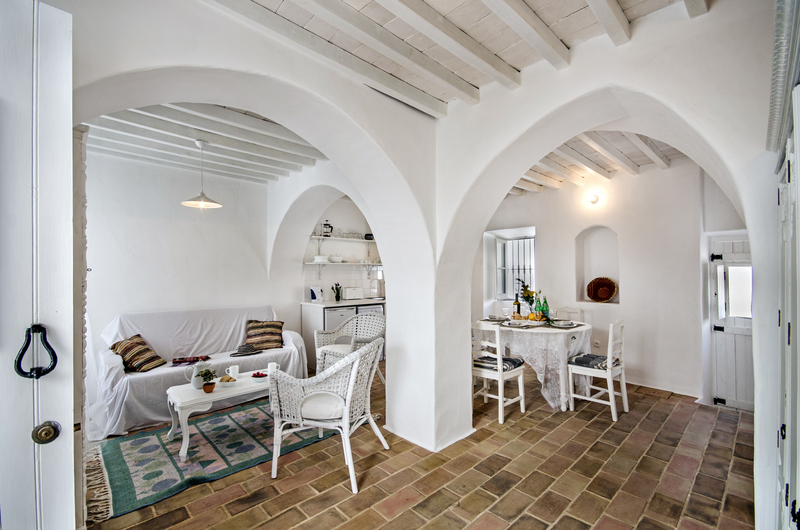 Wonderful stone arches give the living space a wonderful touch of style and interest along with the traditional wooden beamed ceilings and floors tiled and hand made local Santa Catarina terracotta tiles. The ceiling, arches and walls are all whitewashed to keep in taste with the local fashion. A sofa and two white painted rattan chairs surround a white ornamental coffee table and a white dresser adds some shape and interest to the room and contains books and magazines about the area. A flat screen is fitted to the wall and offers a selection of European tv channels. Nearby you will also find the wifi unit that supplies wifi throughout our 2 bedroom holiday home. Also in the open plan room is a white wooden painted table and 4 white wooden painted chairs. This makes for a great place to enjoy local food from the daily markets. The decoration and furnishings in this 2 bedroom holiday home are very much in keeping with the local community and provide simple and clean holiday living. A window looks out to the cobbled pedestrian alley way and can either be open as the window has the added security of decorative wrought iron work or closed with shutters helping to keep the room cool when you are not home. The kitchen consists of some fitted kitchen units along one small wall of the open plan living space. Set in to the work surface is an electric two ring hob. with a modern inox overhead extractor fan to help take away cooking smells from the living space. Under the units is a fridge with a small ice box and a mini dishwasher. In the cupboards and on the shelves is a selection of cooking utensils and cooking pots. alongs with plenty of glasses, mugs, plates. bowls and much more. We have provided an kettle, toaster and capsule coffee machine for your use too. Overlooking the kitchen is a window with old wooden shutters and ornate iron work over the window. This lets in huge amounts of natural light to the room. An arch set into the wall with a stone shelf adds interest to the dining kitchen area. From the ground floor a stone and tiled staircase leads to the first floor. Be careful though as the staircase is open with a small ornate wall and the ceiling is low. This said it is very much what is to be found in these lovely old buildings and simply add to the amazing character of the houses. The master bedroom is at the top of the steps and to the left so overlooks the front of the 2 bedroom holiday home and own to the pretty cobble lane below. adding the traditional feel, they are lovely and cool underfoot in the summer but surprisingly warm in the cooler winter months. 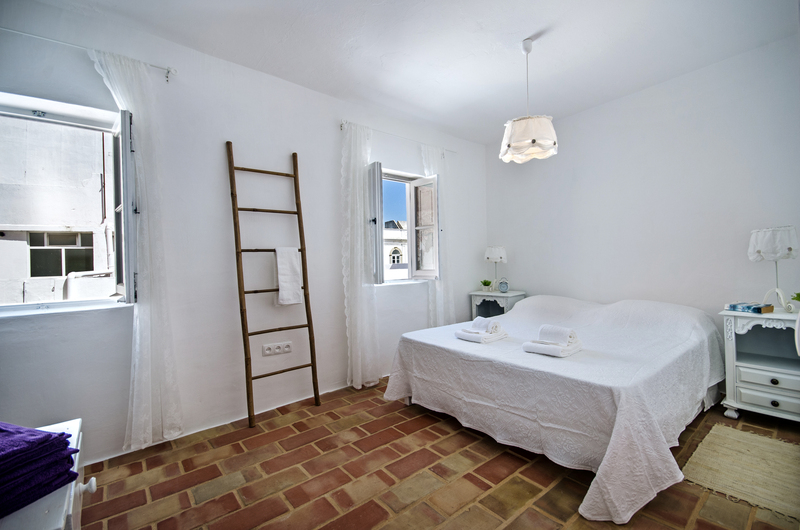 The bedroom offers a large king size bed made with crips white linen and with a selection of hand, bath and beach towels. The restored furniture theme continues and each side of the bed is matching painted bed side units both with a little drawers and a shelf. Each has little ornate wooden carved decorations and a lamp for some pleasant evening light. The bedroom is painted white and is always fresh. This bedroom has two lovely windows offering plenty of light and fresh air but also with shutters to keep the room nice and cool during the hot summers days and nice and dark at night. The windows are wonderful traditional white painted wood and add the continuing wonderful character to the 2 bedroom holiday home. A thoroughly modern wall divides the master bedroom from an area with a walk in shower, toilet and white basin with a super large mirror over head. Some hanging space with hangers is available in the bedroom. along with some tables to place your belongings. 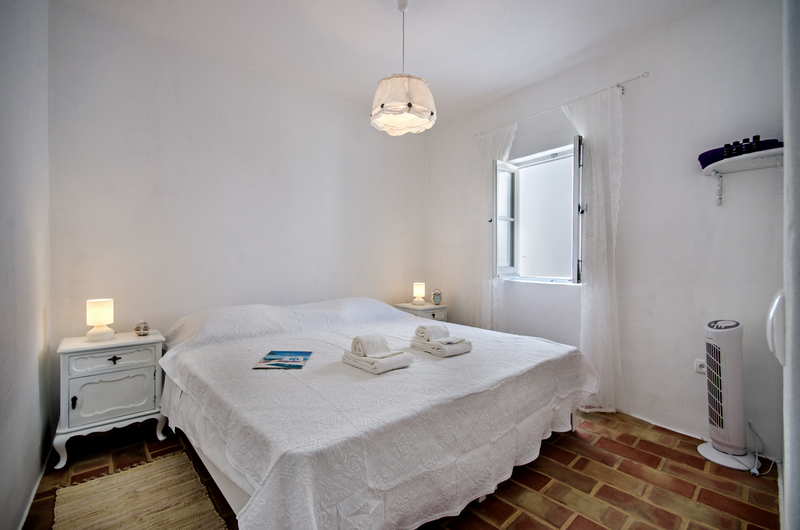 The second bedroom is in front of the steps and offers two comfortable single beds. Again made with freshly laundered linen and with hand, bath and beach towels. Two restored bedside units with ornate carved patterns and cupboard doors and drawers. Each has a pleasant lamp offering ambient light. 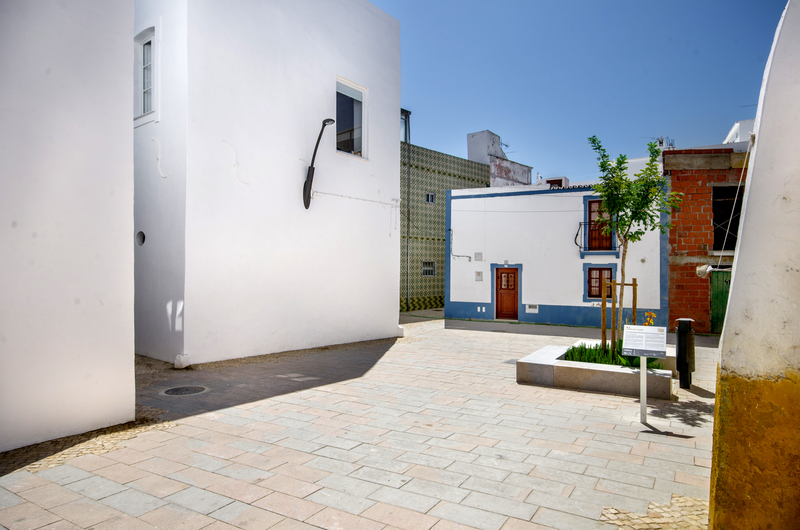 The bedroom has a super window that looks down on to the cobbled alley below and across to the lovely restored Gaibeu square complete with its local legends. The little wooden shutters when closed keep the bedroom cool in the hazy hot Algarve summer days and also nice and dark at night. Above is a curtain pole with pretty delicate white curtains adding some delicacy to the room. A shelf provide a great place for your items. To the right of the steps is a bathroom. 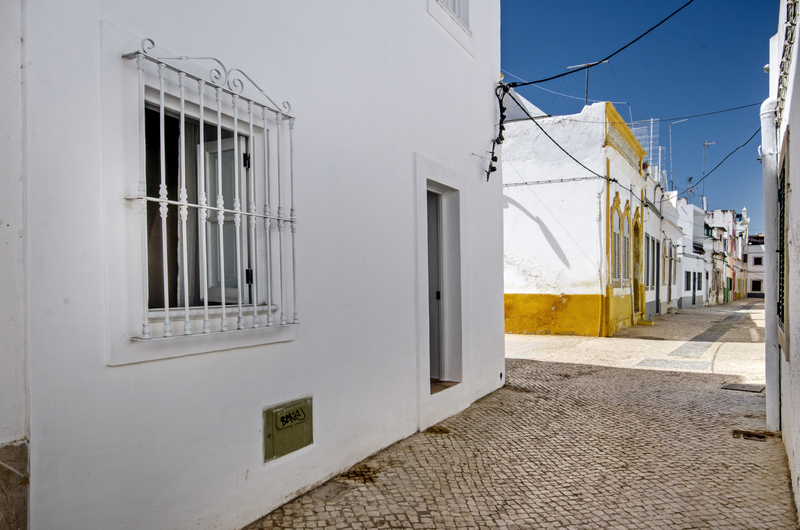 Painted in the traditional white with a large window overlooking Largo do Gaibeu. 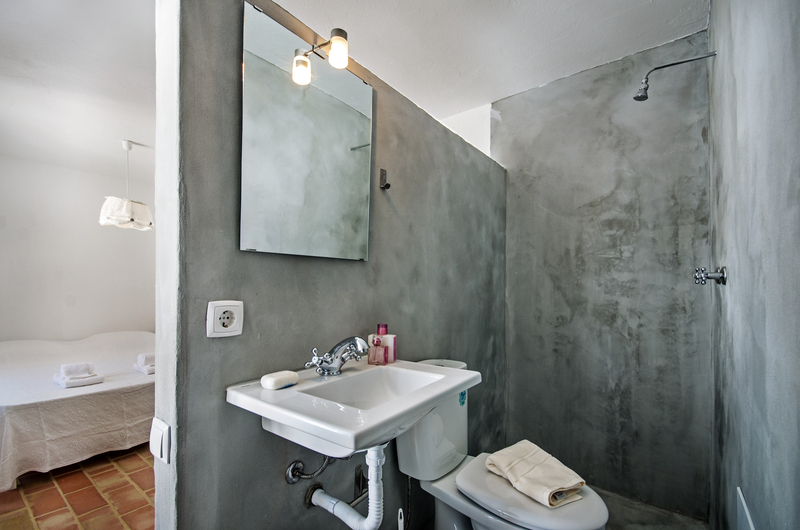 The bathroom in this 2 bedroom holiday home offers a full length walk in shower, toilet and white basin with a super large mirror above. 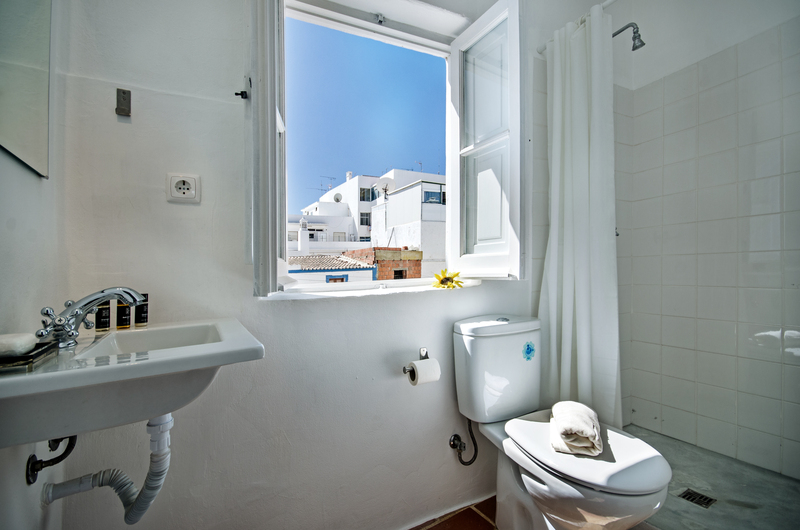 The bathroom is simple, practical and in keeping with this wonderful piece of Olhao history. From the first floor landing steps climb again to the small area that can store sun beds and houses a washing machine. A sweet small wooden door leads on to the lower terrace. This is such a lovely place to enjoy some relaxing time. We have provided sun loungers for you to enjoy and also a dining table and chars to get the best from the terraces. 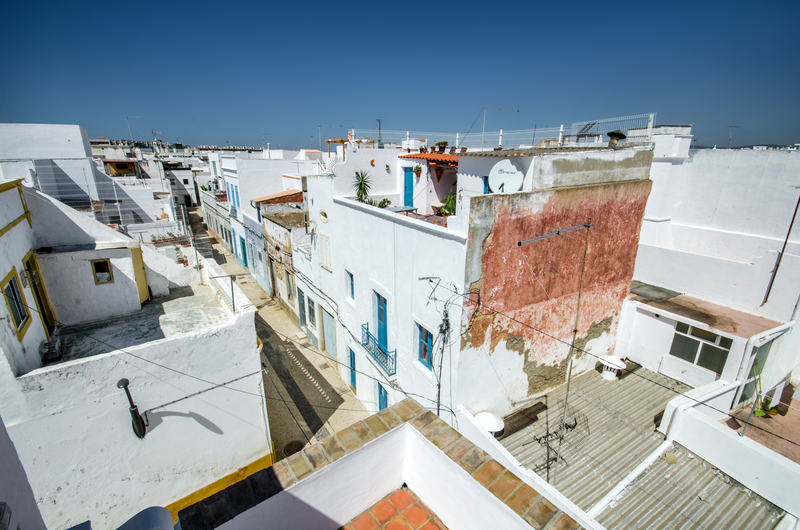 Overlooking the cute little alleys and sweet lite square below, you are very much reminded you are living right in the heart of old town Olhao with all its wonderful history and legends. Steps lead up to the look out, once used by the fishermen's wives to watch their husbands boats come in and know they are back safe form dangerous fishing trips out at sea. The views over the town and towards the sea are simply stunning from this part of the wonderful 2 bedroom holiday home Casa do Gaibeu. 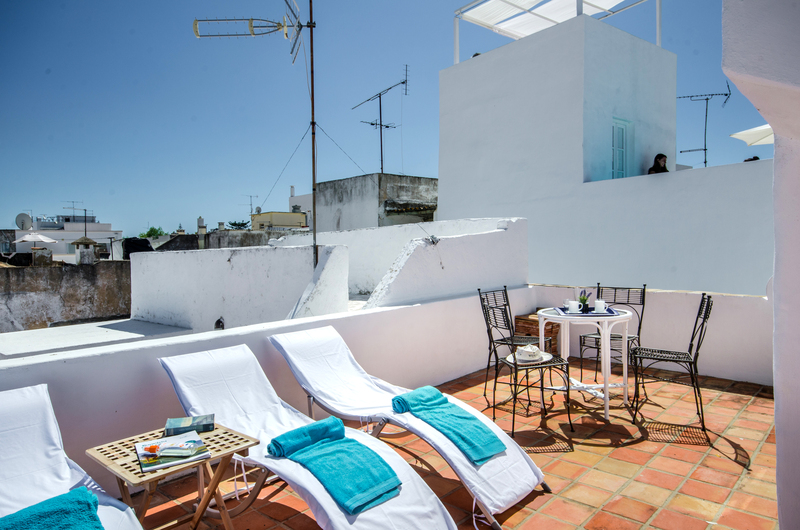 Casa Gaibeu is situated right in the heart of the winding and interesting small pedestrian cobbled streets of the old town of Olhao. Whilst there is no parking close by there is certainly places to park within the town. The location is perfect for those who do not wish to hire a car as everything you could need is in exceptionally easy walking distance. This wonderful little 2 bedroom holiday home provides fabulous and classical old style Olhao accommodation with some modern twists. 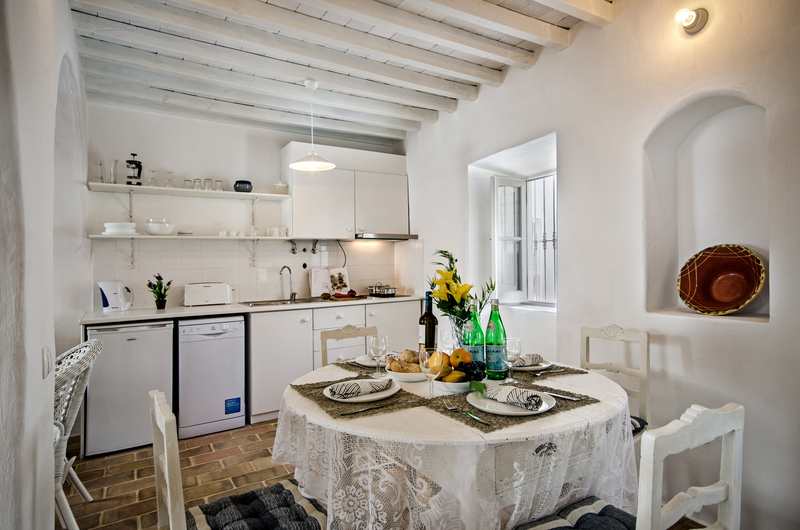 Please do remember wall on the terraces are low, some ceilings are low on the stairs but this all very much adds to the wonderful character of this gorgeous little 2 bedroom holiday home. Our lovely 2 bedroom holiday home comes with its own manual that you can download to your tablet or smart phone. Packed full of information to make the best of your holiday starting from the moment you arrive. It tells you how to collect the keys, who will look after you during your stay and clear concise directions to Casa do Gaibeu. Then it is packed full with details of the best restaurants, taxis and local amenities and activities. "Zuallererst, vielen Dank an das Mars Algarve Team! Sehr freundlich und hilfsbereit, definitiv 5 Sterne verdient. Ich war mit meiner Freundin (wir Mitte 20) und ihren Eltern (50-60 Jahre alt), in dem Haus für 10 Tage, Mitte März. Es war angenehm warm und durch die tolle Lage konnte alles wichtige schnell erreicht werden. Tolle Restaurants, Fischmarkt und Zug sowie Fähre sind in unmittelbarer Nähe. Perfekt wenn man einen entspannten Urlaub haben möchte und dennoch einiges sehen will. Der Zug ist sehr billig und man kann leicht Ziele außerhalb Olhaos erreichen. Mein Tipp, Logos! Besonders zu der Zeit, da weniger Touristen da sind. Zu dem Haus, es ist schön eingerichtet, man hat einen Portugiesischen-Flair. Küchenutensilien sind eher mager, aber das wichtigste ist da und man kann auch "ordentliche" Gerichte kochen. Nur die Pfanne ist schrecklich. Einrichtung entspricht den Fotos zum Großteil. Positiv ist, dass auf der Dachterasse ein ordentlicher Tisch steht an dem auch gut zu viert gegessen werden kann. Die Bänke oberhalb haben gefehlt, waren aber in einer Abstellkammer. Grillen ging auch sehr gut und wir waren froh über den extra Fisch-Rost! Die Matratzen waren recht hart, aber nicht unangenehm. Das einzige was wirklich gestört hat war, dass die Toiletten sehr nah an der Wand waren. Dennoch gab es nichts womit man sich nicht arrangieren könnte und im allgemeinen waren wir sehr zufrieden mit dem Haus! Alles in allem sehr schön und angenehm, Preis-Leistung ist ebenfalls Top. Nur für sehr große Personen etwas zu klein und eng. Vielen Dank für den tollen Urlaub und den guten Service!" 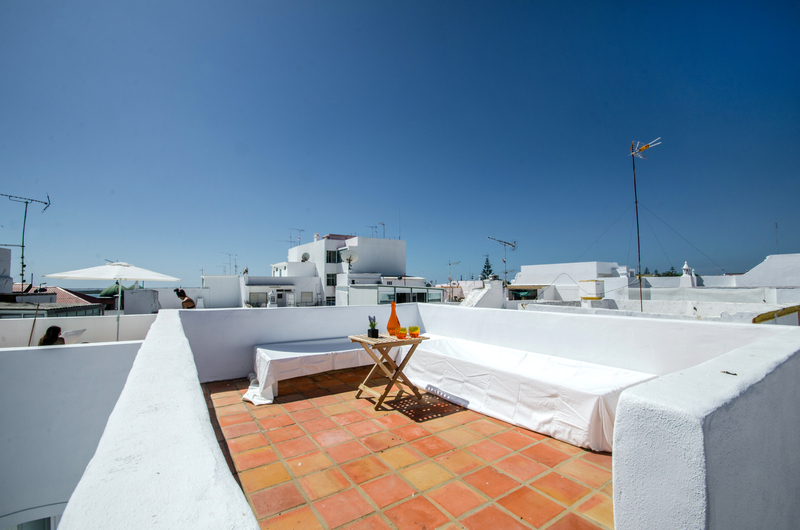 "House very well refurbished in the local style, very well located in the heart of the old village of Olhão. Agency staff very friendly and responsive. I was impressed by the property - plenty of character - loads of facilities - comfortable and very clean - a pleasure Hanna from MARS was helpful, courteous, and reliable and would recommend them to anyone considering a property in the area. it has been wonderful and thank you for making it so comfortable. I would not hesitate to recommend your agency. We enjoyed again, as two years ago, our stay in this extraordinary house within the historical center of Olhao. It has everything to make a stay as pleasant as possible. 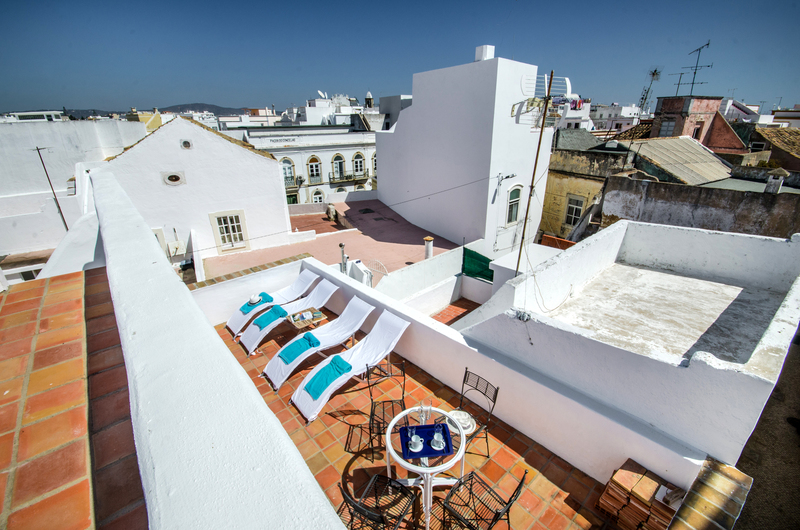 Especially the roof terraces with a great view are the most outstanding feature. It was a lovely little house, in a great location with the sea and markets really close. 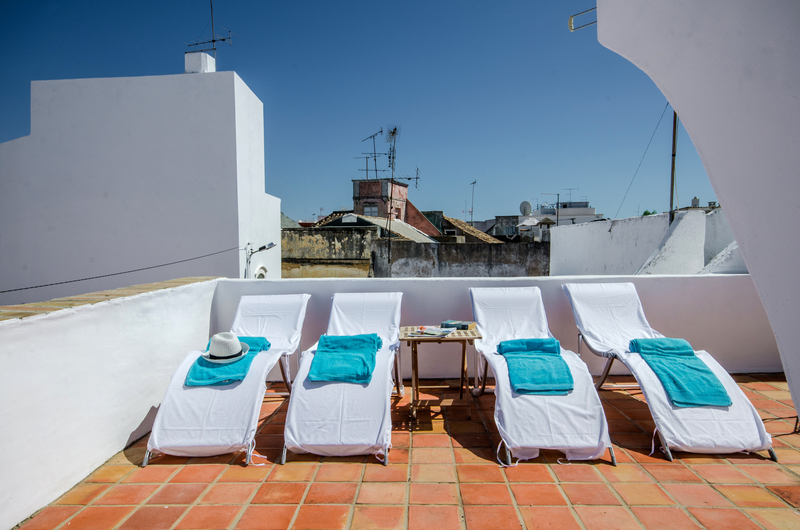 Comfortable beds and the perfect roof terrace. Will definitely be coming back!